ictDATA.org: Is the Internet Stuck? Is the Digital Divide growing or shrinking? In a relative sense, the divide seems to be shrinking. The number of Internet users around the world grew from 381 million in 2000 to 795 million in 2004, an annual average growth rate of 20%. Growth was higher in developing countries so that their share of the world’s Internet users rose from 21% in 2000 to 39% in 2004. 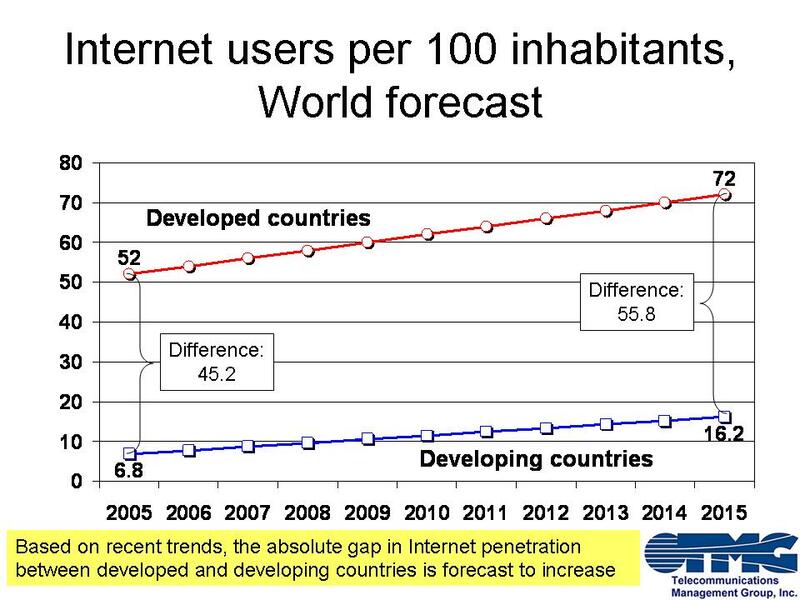 The number of Internet users per 100 inhabitants in developing countries was 1.6 in 2000 rising to 5.9 by 2004. 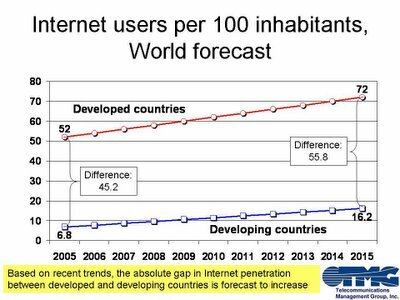 As a result, the relative difference in Internet penetration between developed and developing countries dropped from 19.5 to 8.5 between 2000 and 2004. These numbers suggest that the digital divide is shrinking. Although the relative difference between developed and developing countries has decreased, the absolute difference has increased. The difference between Internet users per 100 inhabitants in developing and developed countries rose 13.6 points between 2000 and 2004, from 30 to 43.6. One alarming statistic is that the annual growth rate in Internet users has been declining since 1998. The intense focus governments around the world have been giving information and communication technology (ICT) has not translated into a dramatic rise in growth and the Internet risks “getting stuck.” If the decline in growth rates continues, then it is unlikely that the World Summit on the Information Society (WSIS) goal “to ensure that more than half the world’s inhabitants have access to ICTs within their reach” will be met by 2015. At current trends, less than a fifth of the developing world will be online by 2015 (see Figure).